Weather extremes are being experienced here in New England during this crazy month of May. April brought a heat wave pushing plants far ahead of schedule, forcing tender new growth to develop and then on the 11th of May we had cold snap and frost. Many buds were killed as well as new leaves damaged by the frost. 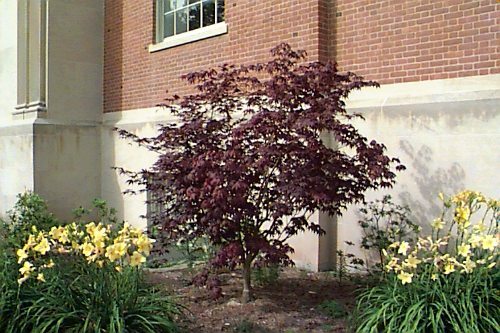 Japanese maples and hydrangeas were particularly hard hit. The damage at first just appears as wilted foliage, but as the days pass, those leaves develop white areas then turn crispy brown before they drop. Some plants are only damaged on the top while others are completely defoliating. The good news is, if you leave the plants alone they will produce new leaves in a few weeks. Keep plants well watered to help the re-leafing process. Last night’s rain and thunderstorms should have cleaned the air of those white fuzzy things floating everywhere. 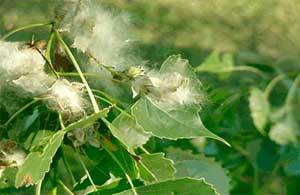 They are seeds of the Poplar or Cottonwood tree, Populus deltoides. This week brought record heat of 99 degrees F! Cool weather loving plants like radish, pansy, spinach and early lettuce will bolt to the seed stage or melt away in this type of heat. Warm season crops will love the ground warming weather but may not have developed a strong root system to deliver enough water to transpiring leaves emitting moisture. The result of giving off too much moisture from the leaves faster than the roots can replace it is shown by wilting. Provide new transplants with shade and plenty of water. Mulch the soil to keep it cool, trapping in moisture. Tomatoes, peppers and other warm season crops can be planted into the garden now without the danger of frost, I hope! 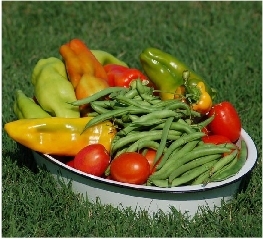 Speaking of vegetables brings hopes of bountiful gardens and large harvests, usually more than one household can consume. Think about donating some of your excess fruits and vegetables to organizations that typically do not receive or have access to farm fresh produce. One way is through Ample Harvest, a program to do just that, started by Gary Oppenheimer, founder of AmpleHarvest.org. He is a Master Gardener from New Jersey who grew this idea in one year into a nationwide success. Their philosophy is simply stated below. Gary has requested we pass on the information to backyard gardeners everywhere. If you know of companies/organizations/foundations that fund anti-hunger efforts, please let me know. Operating AmpleHarvest.org on the national scale that it has achieved requires funding and we’ve started our outreach. The good news is that given the design of the AmpleHarvest.org Campaign, it generates a huge bang for the buck – something donor organizations appreciate. After frost damage on my Japanese maple should I remove the dead leaves or wait till they fall off themselves? All the leaves are totally wilted and dead on the whole tree. It’s small, 3 feet by 4 feet. Could the whole tree be dead? Just leave the leaves on the tree. If the tree is going to push out replacement leaves, the old, damaged leaves will fall off on their own. Only time will tell if the tree will live or not.